There is a 10% buyer’s premium for this sale. 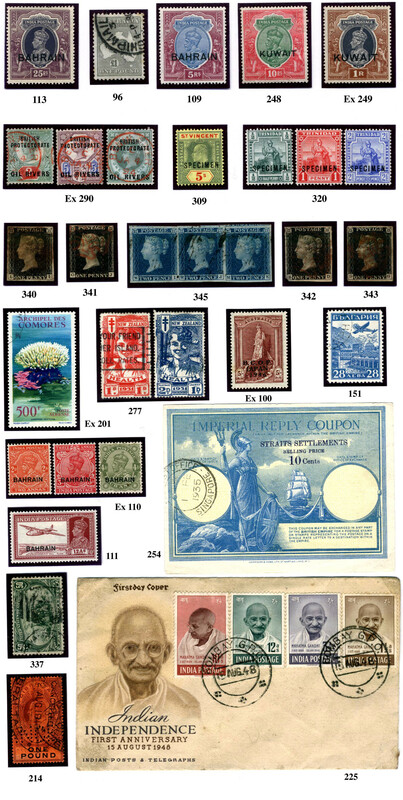 Coins, FFCs, Postcards, Other Collectables, etc. Uganda Railway Telegraph Labels, The following 5 lots are the 1902 issue used on receipt part of telegraph form, and each with Nairobi cancels. Very scarce items in usual mixed condition (quite fine for fiscals/cinderellas!) ‘Hiscocks’ catalogue refers. Viewing is available in the shop during the week preceding the auction; at the venue on the evening of the sale from 5:45, or by appointment. Sorry, there is no shop viewing on the day of sale. Normal shop hours are,- Thursday, Friday and Saturday 10:30 - 5:00, but please always phone before travelling any distance to ensure that we’re open and that you get the welcome you deserve & expect! Our April auction will be on the Monday, 29th April. This auction will be at - Murrayfield Ice Rink. Visit the shop on Facebook.